While most nonprofits can’t enlist the help of Super PACs to raise millions, there are still plenty of fundraising and marketing lessons to learn from the current crop of presidential hopefuls. According to the Federal Elections Commission, over $400 million has already been raised so far this election cycle by all candidates combined, including Super PAC funds. This election is on track to continue setting fundraising records as we get past the primaries and head into the general election. By some estimates, we could reach over $10 billion once all is said and done. So take a page out of the presidential moneymakers manual and check out fundraising lessons that nonprofit organizations can learn from five of the current top candidates. On the fundraising scoreboard, she’s the current leader. And it’s not hard to see why. Not only does she have national name recognition three times over—once as First Lady, then as a presidential candidate in 2008, and again as Secretary of State during the first Obama administration—but her campaign has the ability to capitalize on her greatest asset: her connections. With one stroke, Clinton is able to make the most of two very important aspects of her campaign. First, she is capitalizing on the grandmotherly aspect of her image by saying that she would like to send you (yes, YOU!) a birthday card just like a friend or family member. 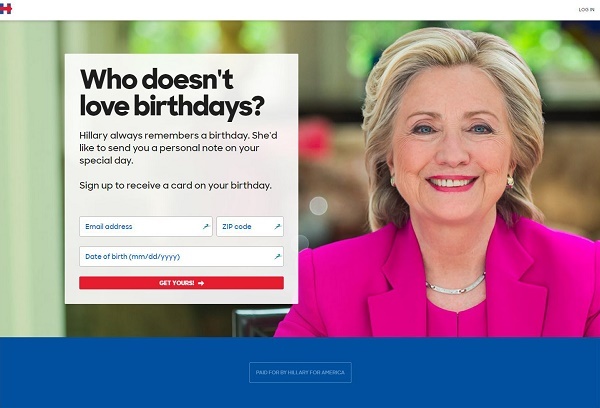 But more significantly, her birthday card gambit is a clever avenue by which the campaign is able to obtain important donor data. However, by requesting this type of “opt-in” data in a friendly and personable manner, the Clinton campaign can now cross-reference donors with publicly-available sources. This means her campaign can determine precise donor demographic data and enlist the aid of targeted marketing campaigns to maximize the effectiveness of their outreach efforts. Fundraising lesson for nonprofits: Track your donor relationships over time within an integrated, unified database and find low-barrier ways to collect and connect additional data points to make the most of comprehensive donor profiles. A relative newcomer to the national spotlight—although in Beltway years, it seems like he’s been around forever—Marco Rubio is not the first candidate to attempt to make the leap from Senator to President. What’s unique about Rubio’s campaign is how he is repurposing his Senatorial resources to give a boost to his presidential coffers. According to Bloomberg, Rubio spokesman Alex Conant said the presidential committee inherited a total of $3.2 million from the Senate campaign committee. Without the Senatorial campaign funds, Rubio’s fundraising campaign efforts would put him in 6th place in overall fundraising among candidates of either party. However, once his Senatorial resources were brought into the fold, Rubio’s tally buoyed him into second place, just behind Clinton. Fundraising lesson for nonprofits: By taking full stock of your nonprofit’s assets, particularly restricted funds, you will be able to get an enhanced view of your nonprofit finances and optimize use of donations. Find existing assets that can be used to fund your current projects while honoring donor intent so that non-restricted donations may be used as needed for general funding. If your lead gen list doesn’t read like a who’s who of Fortune 500 CEOs, not to worry. As Vermont Senator Bernie Sanders shows, it’s possible to build a broad support base without the backing of a handful of deep-pocketed individuals. In fact, over three-fourths of Sanders’ war chest is filled with what, in the campaign finance world, more or less amounts to loose change. However, for the Sanders campaign, this is a good thing. It backs up the claim he often makes on the campaign trail that his is a “grassroots” movement with populist appeal. Sanders announced his candidacy two weeks after Clinton and according to self-reported figures by both campaigns, more individuals have so far donated to Sanders’ campaign (284,000) than Clinton’s (250,000). To achieve this level of broad support, Sanders has made it easy to support him and to pass along his message. His outreach messages rarely ask for more than $10 at a time and increasing contributions are framed in the context of specific events, making them appear more motivational. In addition, his website allows donors find other local supporters and organize volunteer-led events on Sanders’ behalf. Fundraising lesson for nonprofits: Sometimes nonprofit organizations spend a disproportionate amount of time focusing on major gifts, they don’t appreciate the value of grassroots support. Make sure to attract and connect with those making smaller gifts. Lower or remove the barriers to donations and encourage small gifts more frequently and provide incentives to gradually increase gifts. These concepts are essential to monthly sustainer campaigns and annual fund efforts. When creating these type of programs, make sure to use online donation tools—with as much automation as possible—that are fully integrated to your back-end donor management systems. On the flip side of the donor demographic coin, if your nonprofit organization is trying to focus your fundraising efforts more precisely to attract more affluent donors, take a fundraising lesson Jeb Bush. In contrast to Sanders, Bush relies almost exclusively on Super PAC money and maximum donations from big-ticket donors. While the average contributor to Sanders’ campaign gives $38, the average Bush donor clocks in at $926. The most common denomination for a donor to Bush was the legal maximum of $2,700. More than 3,400 donors gave Bush a maximum-sized contribution. Fundraising lesson for nonprofits: Know where your major gift donors are and court them appropriately. The most effective way to do this is through careful donor segmentation. Remove your big-ticket supporters from your run-of-the-mill everyday outreach campaigns. Create separate marketing lists with dashboards to track “ask progress” and be sure to send out handwritten thank-you notes and personal phone calls after every big donation. Value your major gift supporters and they will add value to your nonprofit organization. Whether you like him or not, no one should doubt Donald Trump’s ability to create a stir in any market. From multi-million dollar real estate deals to owning over 500 different businesses to being a television star, Trump knows how to stretch his influence to create traction. Sure, he’s collected fewer overall campaign contributions than his fellow Republican challengers Ben Carson, Rand Paul, Mike Huckabee, or even Lindsay Graham. But how much have you heard about those other candidates recently? Probably not much. According to Google Trends, Trump is more talked-about now than ever. We may not have even recently reached “Peak Trump”. Of course, it’s important to note the distinction between “curiosity” and “interest.” As reported by political stats wonk blog, FiveThirtyEight, the number of Google Searches often has a correlation to actual news coverage—but not always. Check out the Trump spike below… then notice the difference between Bush’s mainstream media mentions (as tracked on Google News) versus candidacy announcement spikes as shown by Trump and fellow GOP contender, Ted Cruz. *StratusLIVE, LLC does not contribute to, publicly endorse, or in any other way lend formal support to any political candidate, presidential or otherwise. Posted in: Fundraising, News | Tags: Analytics, business intelligence, campaign, Communication, Constituent, Donation, Donor, Donor data, Donor Database, Donors, Fundraiser, Fundraising, Giving, Marketing, Marketing Analytics, Nonprofit, Online Donations, Relationship, Relationships, Social Media, Software.